About Us - Ulster Language Services | A professional Translation, Interpreting and Tuition Agency in Northern Ireland. We know what we are talking about! 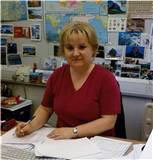 Régine McCullough is the owner of Ulster Language Services. Originally from France, Régine studied foreign languages and was awarded a Degree in English and Spanish from the University of Caen (Normandy). After moving to Northern Ireland she obtained a Postgraduate Diploma in Marketing from the University of Ulster and a few years later she was awarded the Diploma in Translation from the Chartered Institute of Linguists. Before founding her own agency, Ulster Language Services, Régine held a senior post in a local translation and interpreting agency where she organised thousands of translation, interpreting and tuition assignments for clients over a 15 year period, as well as providing language and IT support for prestigious international conferences and European project meetings.